After running as part of Team Squirrel three times, super squirrel Christian took on the challenge of completing the Royal Parks Half Marathon as our mascot Chester the Squirrel in 2017. I first ran the Royal Parks Half Marathon back in 2011. It was my first organised run and I loved it! After that I easily got caught up in all the London 2012 enthusiasm and signed up for the London Marathon quickly followed by the Great Wall of China Marathon. I’ve run London once more since, but for me half marathons are the perfect distance running event – it’s long enough to give you a genuine sense of achievement but modest enough that the training doesn’t have to take over your life. And of all the half marathons to run, the Royal Parks Half is definitely the one to do. This race is one run that feels it has been organised as much with spectators in mind as runners. The many switchbacks in the park section mean your friends and family have the opportunity to see you numerous times and with the app it’s easy to know where you are. So, encourage people to come down for the day and support you, it’s a really good day out for everyone! If you’re going for a good time, which many do since the course is fast, try to incorporate some hills or stair climbs into your training. The course is very flat but there are a few gentle climbs and it’s easy to see your pace dip as stride length shortens. Being prepared for this and just picking your knees up a bit keeps the momentum up and will see you sail past your fellow runners. You’ll need to get some miles in your legs but don’t limit your training just to running. I find cross-training machines in the gym a really good alternative. They’re low impact, slightly unfashionable so invariably free and get you in the habit of really using your arms as you move. If you dig up an old album or two you haven’t listened to for a while you can easily lose yourself for an hour or so. For variety, swimming is another good way of increasing your aerobic capacity while going easy on the joints. I certainly recall the first time I trained for a half marathon the most daunting aspect wasn’t so much the running itself but rather the idea of doing any kind of exercise for such a long period. 5K had been my limit before, so it really was a case of just getting used to a couple of hours exercise whatever that might be. If you’re going to be using gels or other such fuel during the run, make sure you build that into your training. Personally, the gels don’t really agree with me, I rely on jelly babies, but whatever it is don’t let the day of the race be the first time you use them. Before the London Marathon this year I did quite a lot of testing in the gym measuring how long it took for the rush of a single jelly baby to hit me and how long that rush lasted. That helped me plan how many to carry and when I should take them, since you don’t want to wait until you really need the energy before taking it, you need to be a bit preemptive. 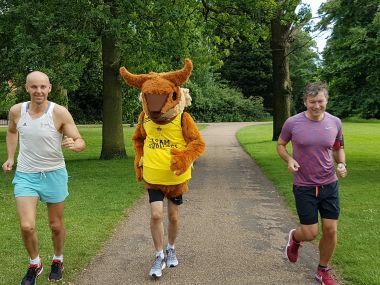 I’m looking forward to running as Chester this year as I’ve really come to feel part of Team Squirrel over the years (this will be my fourth run with them). I’ll be doing a few training runs in full costume, and hope to see many of you in the park when we get together for those over the summer. Feeling inspired by this story? We are currently recruiting for the next Chester to run in the Royal Parks Half 2019. If this sounds like you, apply now to get a chance to represent the Royal Parks in the race on Sunday 13 October 2019. The winner will be announced in March.